Ancient & Illustrious Order Knights of Malta ribbon. A round, white celluloid pin with black emblem printed on it, the standard A&IOKM emblem: Maltese cross with eagles between the arms, a Latin cross in the center, here wrapped in a vine or roses, the motto “In Hoc Signo Vinces” around the inner perimeter of the circle. The lateral arms also have K and M on them, respectively. The ribbon is split vertically, red and black, and printed in dull gold. “Annual Field Day. Ancient and Illustrious Order Knights of Malta. Harrisburg, PA.” The fly end is swallowtail cut. From the rosette pinback top hangs two straight ribbons; one red, printed in gold with, “A. & I. O. KNIGHTS OF MALTA. MAY 8, 1906” and one black, also printed in gold, “AID” in large letters and with a three-pointed decorative device on either side. 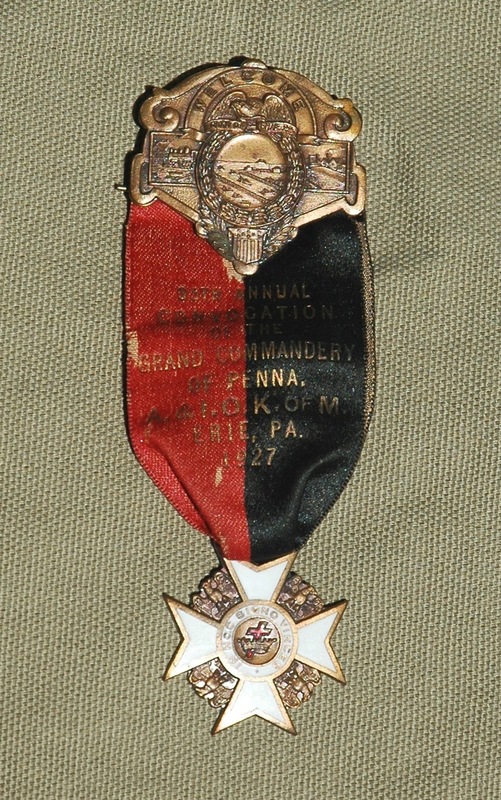 Ancient & Illustrious Order Knights of Malta medal on a drape ribbon. Metal pinback top, black and red ribbon with gold lettering, and enameled pendant medal cross. Medal is an A&IOKM cross, cast with highly detailed relief in bronze metal, with eagles between the arms, which are decorated with white enamel. Center circle is white enamel and reads “In hoc Signo Vinces” around a crowned cross emblazoned with red enamel. Verso has the maker’s mark of Bastian Brothers, Rochester, NY. 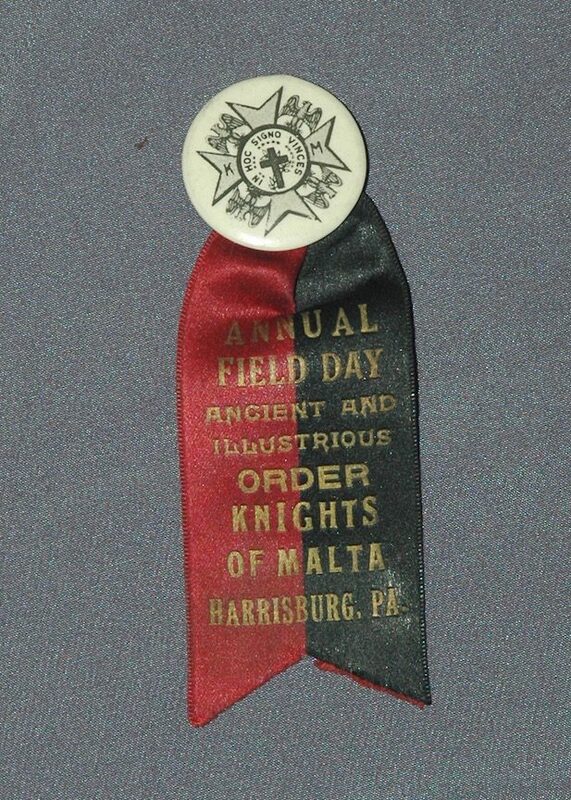 Ancient & Illustrious Order Knights of Malta medal on a ribbon fragment. Cast pewter or coin metal pinback top, a fragment of ribbon, and a cast metal cross pendant medal. 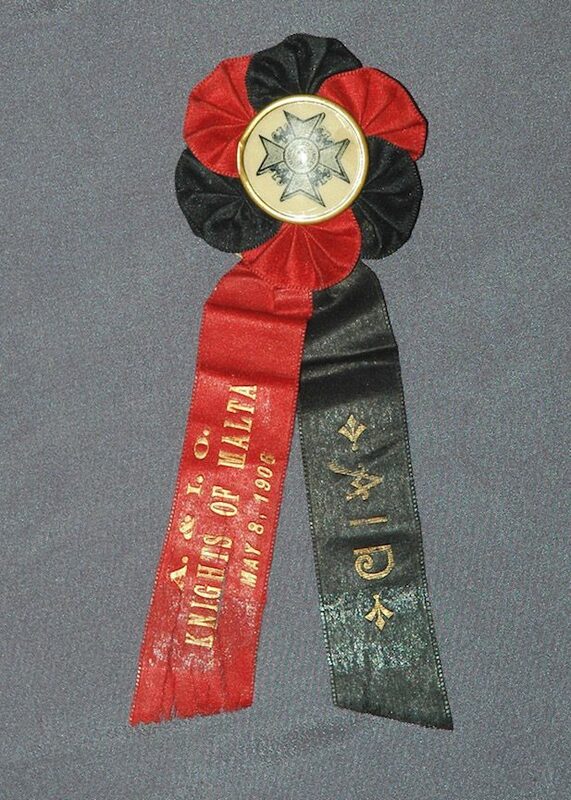 Ribbon is split vertically, black and red, standard of A&IOKM medals, but is fragmentary. It is still attached at the pinback top, but the bottom is ragged and ripped. 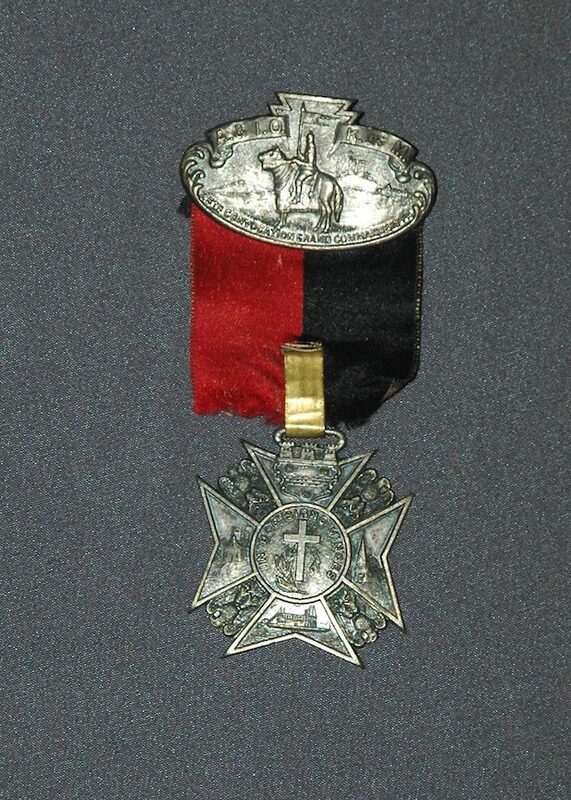 A soft metal band has been added, piercing the ribbon and joining the cross medal below. 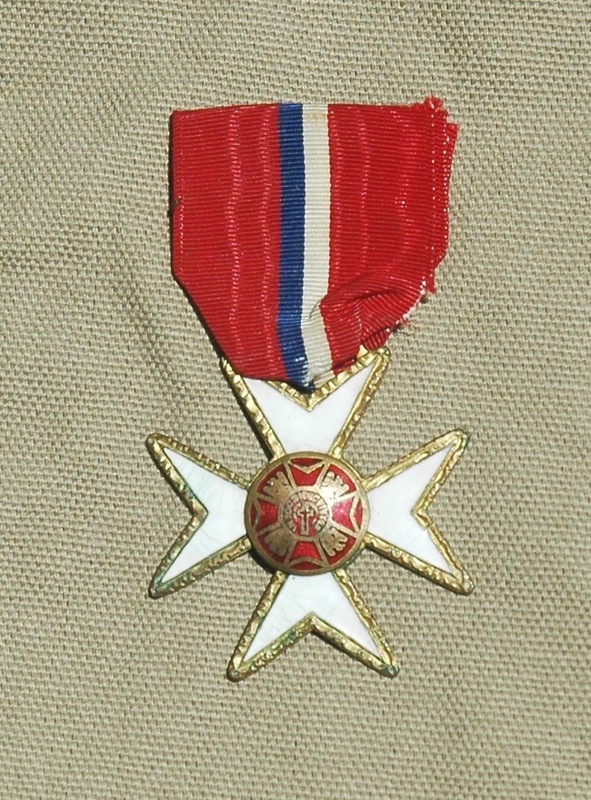 Cross medal is a more elaborate rendition of the Knights standard Maltese cross. Eagles are positions between the arms, which each have an image in relief inside them. Upper arm shows what is perhaps a heraldic device with three castle towers, three courses of masonry, three medallions. Lower arm has a paddle boat on the water. Dexter arm shows what is probably a schoolhouse, with a flag flying from a pole. Sinister arm has a church with a tall steeple. Ancient & Illustrious Order Knights of Malta uniform cross medal on drape ribbon. Pinback top is missing. Drape ribbon is red with blue and white vertical stripes from top to bottom. Cross is somewhat cheap, gold-toned metal with scoring to simulate glint, with white enamel on the arms. Center is red enamel with another complete cross, with Eagles between the arms, the legend “In Hoc Signo Vinces” in the center above a Latin cross.